Click HERE to see the replacement. Made by hams for hams, this ruggedized case was 3D printed using ABS plastics ensuring that your DVMega can withstand Field Day and Every Day. Compatible with the Raspberry Pi B+, 2, and 3 models so that you don’t have to upgrade unless you want to. 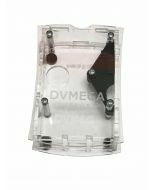 Included in this case is a precisely molded standoff bracket for the DVMega allowing for the most secure fit to your Pi. This enclosure has LED windows to support all models of the Pi, and an antenna port located topside which will accommodate most SMA antennas. Have no fear, this sleek, rugged and efficient solution will work with the UHF or VHF/UHF DVMegas. Use this with your existing equipment or check out our complete DVMega bundles using this case at ZXX-DVMEGA-01-K (UHF) and ZXX-DVMEGA-02-K (VHF/UHF) and get a discounted price.